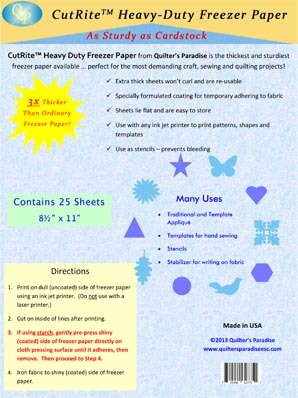 3x thicker than ordinary freezer paper! This freezer paper is the thickest and sturdiest freezer paper available ... perfect for the most demanding craft, sewing and quilting projects! Use it for traditional and template appliqué; templates for hand sewing; stencils; and stabilizer for writing on fabric. Package contains 25 8-1/2" x 11" Sheets.